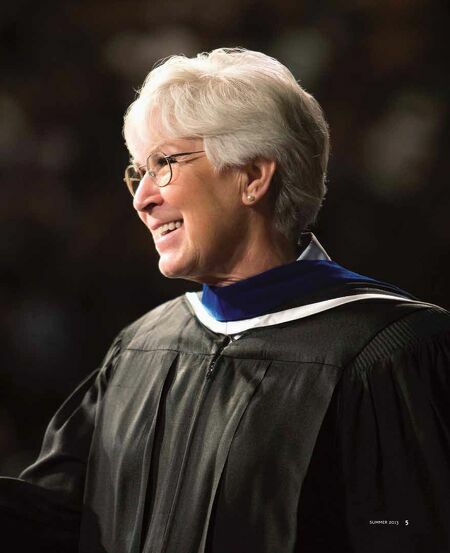 convocation address given by gail miller I am not a college graduate. I was content to be a wife, mother, and homemaker, but four years ago my life changed course. Two events led me into business: the passing of my husband, Larry, and becoming sole owner of a large group of businesses. Today I am responsible for one of the ten largest, privately owned automotive groups in the country. Last year I represented Utah as Time magazine's Dealer of the Year. In 2009 Larry, who had just passed away, and I were named entrepreneurs of the decade by MountainWest Capital Network. 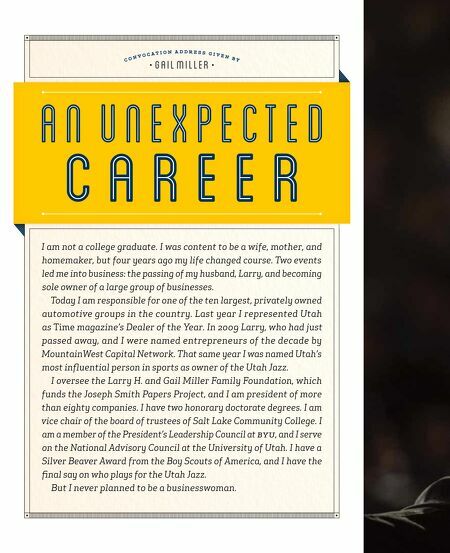 That same year I was named Utah's most influential person in sports as owner of the Utah Jazz. I oversee the Larry H. and Gail Miller Family Foundation, which funds the Joseph Smith Papers Project, and I am president of more than eighty companies. I have two honorary doctorate degrees. I am vice chair of the board of trustees of Salt Lake Community College. I am a member of the President's Leadership Council at BYU, and I serve on the National Advisory Council at the University of Utah. I have a Silver Beaver Award from the Boy Scouts of America, and I have the final say on who plays for the Utah Jazz. But I never planned to be a businesswoman.